Ranging from 800 square feet to less than 100 — much below the North American norm — these “tiny homes” can house a diverse lot: for people seeking transitional and permanent affordable choices in desirable communities, for the many interested in “living green” in a small space, and others seeking shelter closer to family or friends. Photo: Architect Vina Lustado’s Tiny House in Ojai, California, by Jack Eidt. For a video tour, see below. The building code was designed around the idea that every home is permanently built to the ground. Their main concern is safety, ensuring that rooms fit minimum sizing requirements to host full size appliances. “Those minimum size restrictions are actually impacting the Tiny House Movement because if tiny houses were built and anchored to the ground, their rooms would be too small to meet the building code,” says architect David Ludwig. 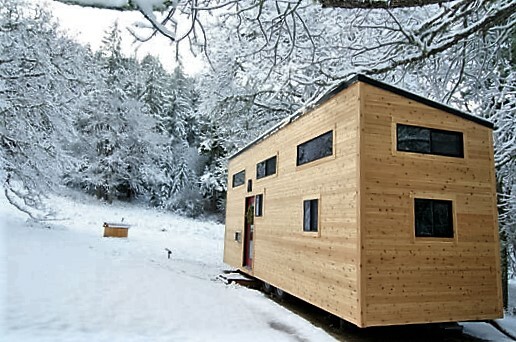 Andrew Morrison: “Beyond the cost, we saw that the environmental impacts of our [big] house were bigger than what we wanted to live with.” Photo: Morrison’s tiny house in an Oregon winter from Yes Magazine. Tiny House village proposed for mega-expensive San Francisco by Chelsea Rustrum and designed by David Ludwig, from Tech Insider. Whatever the path, cities in Cascadia [and beyond] can embrace tiny living as one small piece of our housing future. Founded in 1993, Sightline Institute is committed to making the Northwest a global model of sustainability, with strong communities, a green economy, and a healthy environment. They work to promote smart policy ideas and monitor the region’s progress towards sustainability. Check out these free tiny house designs from Morning Chores.